Thanks to Jon XVI for the heads up. When you’re trying to be good, but you want the @goodomensprime trailer so bad. This unlikely duo has no time to waste. 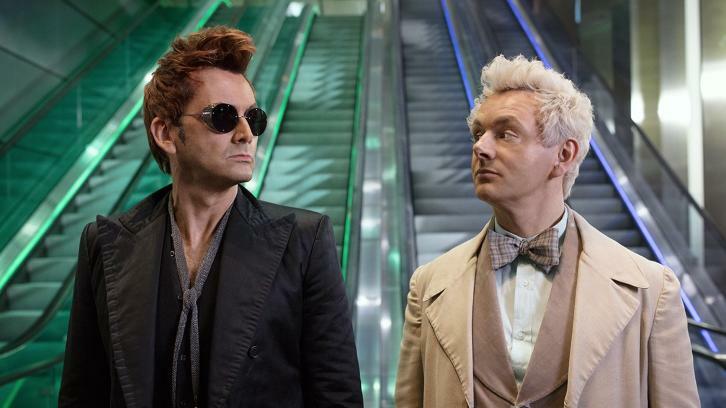 Good Omens debuts May 31 only on Amazon Prime Video. The end is nigh. #GoodOmens: Based on the best-selling novel by renowned authors Terry Pratchett and Neil Gaiman, this series follows the story of Aziraphale, an angel, and Crowley, a demon, who have formed an unlikely friendship spanning 6,000 years and have grown fond of life on earth. However, the end of time grows near with the approaching Armageddon and they must now join forces to find a way to save the world. Per Neil Gaiman, all 6-episodes, May 31. Benedict Cumberbatch (Sherlock, Doctor Strange) will voice Satan. "It's a giant animated Satan. He turns up and we needed a performance that works. So we found a young British help that needed a lot of direction from Douglas… Benedict Cumberbatch," said Neil Gaiman. The search for the #MissingAntichrist continues when #GoodOmens premieres in 2019. During the San Diego Comic-Con panel for Good Omens, it was revealed that Frances McDormand will be the "voice of God" in the 6-episode Amazon adaptation per Deadline. As well as being the narrator of the series, McDormand will make a single vocal appearance as God in Good Omens, I hear – at a certain Garden. In Good Omens, the novel, Metatron is characterized as "the Voice of God. But not the voice of God. An entity in its own right. Rather like a Presidential spokesman." But some of the most beloved parts of the book are staying the same: Gaiman and Mackinnon confirmed that yes, the show will include a Queen-heavy soundtrack. "We knew God would be a woman," Gaiman said. "We were talking about great American actresses because we wanted her to have an American voice. And out the blue one day I got an email from Frances McDormand asking to borrow my house in Scotland."